The Kizugawabashi Bridge (木津川橋) crossing the Kizugawa River in front of Osaka Prefectural Office, Osaka. 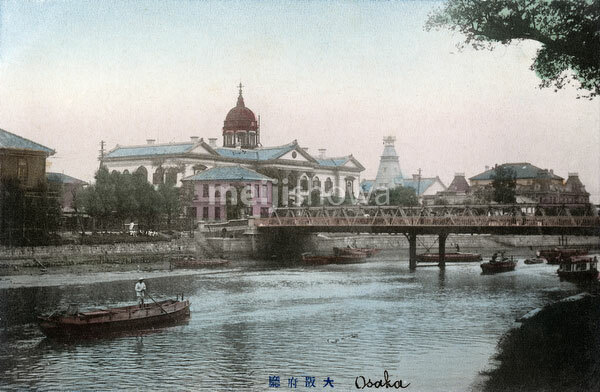 During the Meiji (1868-1912) and Taisho (1912-1926) periods, Osaka’s Prefectural Office was located on the small island of Enokojima (江之子島), between the Kizugawa River and the Hyakkenbori Canal (百间堀). Completed in July 1874 (Meiji 7), the gorgeous Neo-Renaissance style building featured a dome on top. In 1926 (Taisho 15), the Prefectural Office moved to its current location in Otemae, Chuo-ku. The old Prefectural Office building was used as the Prefectural Industrial Promotion Office until it was destroyed by fire bombs during WWII. Also see image #110607-0032.